Carl Rogers (1902-1987) was a humanistic psychologist who agreed with the main assumptions of Abraham Maslow, but added that for a person to "grow", they need an environment that provides them with genuineness (openness and self-disclosure), acceptance (being seen with unconditional positive regard), and empathy (being listened to and understood). Without these, relationships and healthy personalities will not develop as they should, much like a tree will not grow without sunlight and water. Rogers believed that every person could achieve their goals, wishes, and desires in life. When, or rather if they did so, self actualization took place. This was one of Carl Rogers most important contributions to psychology, and for a person to reach their potential a number of factors must be satisfied. "The organism has one basic tendency and striving - to actualize, maintain, and enhance the experiencing organism” (Rogers, 1951, p. 487). Rogers rejected the deterministic nature of both psychoanalysis and behaviorism and maintained that we behave as we do because of the way we perceive our situation. "As no one else can know how we perceive, we are the best experts on ourselves." Carl Rogers (1959) believed that humans have one basic motive, that is the tendency to self-actualize - i.e., to fulfill one's potential and achieve the highest level of 'human-beingness' we can. Like a flower that will grow to its full potential if the conditions are right, but which is constrained by its environment, so people will flourish and reach their potential if their environment is good enough. However, unlike a flower, the potential of the individual human is unique, and we are meant to develop in different ways according to our personality. Rogers believed that people are inherently good and creative. They become destructive only when a poor self-concept or external constraints override the valuing process. Carl Rogers believed that for a person to achieve self-actualization they must be in a state of congruence. This means that self-actualization occurs when a person’s “ideal self” (i.e., who they would like to be) is congruent with their actual behavior (self-image). Rogers describes an individual who is actualizing as a fully functioning person. The main determinant of whether we will become self-actualized is childhood experience. Rogers believed that every person could achieve their goals, wishes, and desires in life. When they did self-actualization took place. For Rogers (1961) people who can self-actualize, and that is not all of us, are called fully functioning persons. This means that the person is in touch with the here and now, his or her subjective experiences and feelings, continually growing and changing. In many ways, Rogers regarded the fully functioning person as an ideal and one that people do not ultimately achieve. It is wrong to think of this as an end or completion of life’s journey; rather it is a process of always becoming and changing. 1. Open to experience: both positive and negative emotions accepted. Negative feelings are not denied, but worked through (rather than resorting to ego defense mechanisms). 2. Existential living: in touch with different experiences as they occur in life, avoiding prejudging and preconceptions. Being able to live and fully appreciate the present, not always looking back to the past or forward to the future (i.e., living for the moment). 3. Trust feelings: feeling, instincts, and gut-reactions are paid attention to and trusted. People’s own decisions are the right ones, and we should trust ourselves to make the right choices. 4. Creativity: creative thinking and risk-taking are features of a person’s life. A person does not play safe all the time. This involves the ability to adjust and change and seek new experiences. 5. Fulfilled life: a person is happy and satisfied with life, and always looking for new challenges and experiences. For Rogers, fully functioning people are well adjusted, well balanced and interesting to know. Often such people are high achievers in society. Critics claim that the fully functioning person is a product of Western culture. In other cultures, such as Eastern cultures, the achievement of the group is valued more highly than the achievement of any one person. Central to Rogers' personality theory is the notion of self or self-concept. This is defined as "the organized, consistent set of perceptions and beliefs about oneself." The self is the humanistic term for who we really are as a person. The self is our inner personality, and can be likened to the soul, or Freud's psyche. The self is influenced by the experiences a person has in their life, and out interpretations of those experiences. Two primary sources that influence our self-concept are childhood experiences and evaluation by others. According to Rogers (1959), we want to feel, experience and behave in ways which are consistent with our self-image and which reflect what we would like to be like, our ideal-self. The closer our self-image and ideal-self are to each other, the more consistent or congruent we are and the higher our sense of self-worth. A person is said to be in a state of incongruence if some of the totality of their experience is unacceptable to them and is denied or distorted in the self-image. 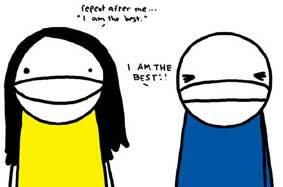 Self-worth (or self-esteem) – what we think about ourselves. Rogers believed feelings of self-worth developed in early childhood and were formed from the interaction of the child with the mother and father. Self-image – How we see ourselves, which is important to good psychological health. Self-image includes the influence of our body image on inner personality. At a simple level, we might perceive ourselves as a good or bad person, beautiful or ugly. Self-image affects how a person thinks, feels and behaves in the world. Ideal self – This is the person who we would like to be. It consists of our goals and ambitions in life, and is dynamic – i.e., forever changing. The ideal self in childhood is not the ideal self in our teens or late twenties etc. Carl Rogers (1951) viewed the child as having two basic needs: positive regard from other people and self-worth. How we think about ourselves, our feelings of self-worth are of fundamental importance both to psychological health and to the likelihood that we can achieve goals and ambitions in life and achieve self-actualization. Self-worth may be seen as a continuum from very high to very low. For Carl Rogers (1959) a person who has high self-worth, that is, has confidence and positive feelings about him or herself, faces challenges in life, accepts failure and unhappiness at times, and is open with people. A person with low self-worth may avoid challenges in life, not accept that life can be painful and unhappy at times, and will be defensive and guarded with other people. Rogers believed feelings of self-worth developed in early childhood and were formed from the interaction of the child with the mother and father. As a child grows older, interactions with significant others will affect feelings of self-worth. Rogers believed that we need to be regarded positively by others; we need to feel valued, respected, treated with affection and loved. Positive regard is to do with how other people evaluate and judge us in social interaction. Rogers made a distinction between unconditional positive regard and conditional positive regard. Unconditional positive regard is where parents, significant others (and the humanist therapist) accepts and loves the person for what he or she is. Positive regard is not withdrawn if the person does something wrong or makes a mistake. The consequences of unconditional positive regard are that the person feels free to try things out and make mistakes, even though this may lead to getting it worse at times. People who are able to self-actualize are more likely to have received unconditional positive regard from others, especially their parents in childhood. Conditional positive regard is where positive regard, praise, and approval, depend upon the child, for example, behaving in ways that the parents think correct. Hence the child is not loved for the person he or she is, but on condition that he or she behaves only in ways approved by the parent(s). At the extreme, a person who constantly seeks approval from other people is likely only to have experienced conditional positive regard as a child. A person’s ideal self may not be consistent with what actually happens in life and experiences of the person. Hence, a difference may exist between a person’s ideal self and actual experience. This is called incongruence. Where a person’s ideal self and actual experience are consistent or very similar, a state of congruence exists. Rarely, if ever, does a total state of congruence exist; all people experience a certain amount of incongruence. The development of congruence is dependent on unconditional positive regard. Carl Rogers believed that for a person to achieve self-actualization they must be in a state of congruence. According to Rogers, we want to feel, experience and behave in ways which are consistent with our self-image and which reflect what we would like to be like, our ideal-self. The closer our self-image and ideal-self are to each other, the more consistent or congruent we are and the higher our sense of self-worth. A person is said to be in a state of incongruence if some of the totality of their experience is unacceptable to them and is denied or distorted in the self-image. 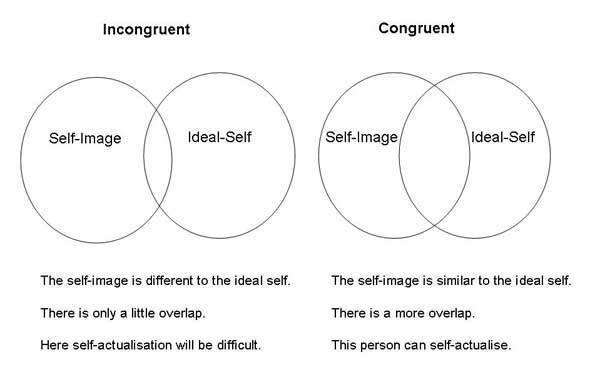 Incongruence is "a discrepancy between the actual experience of the organism and the self-picture of the individual insofar as it represents that experience. As we prefer to see ourselves in ways that are consistent with our self-image, we may use defense mechanisms like denial or repression in order to feel less threatened by some of what we consider to be our undesirable feelings. A person whose self-concept is incongruent with her or his real feelings and experiences will defend because the truth hurts. "When I look at the world I'm pessimistic, but when I look at people I am optimistic." "The very essence of the creative is its novelty, and hence we have no standard by which to judge it" (Rogers, 1961, p. 351). "I have gradually come to one negative conclusion about the good life. It seems to me that the good life is not any fixed state. It is not, in my estimation, a state of virtue, or contentment, or nirvana, or happiness. It is not a condition in which the individual is adjusted or fulfilled or actualized. To use psychological terms, it is not a state of drive-reduction, or tension-reduction, or homeostasis" (Rogers, 1967, p. 185-186). "The good life is a process, not a state of being. It is a direction not a destination" (Rogers, 1967, p. 187).